COLORADO SPRINGS, CO--(Marketwired - Apr 16, 2015) - Gold Resource Corporation (NYSE MKT: GORO) (the "Company") today announced the discovery of new high grade polymetallic veins at its Arista deposit, including a newly discovered vein referred to as "Viridiana," with drill intercepts of 7.04 meters grading 9.29 grams per tonne (g/t) gold and 957 g/t silver. Gold Resource Corporation is a gold and silver producer with operations in Oaxaca, Mexico and exploration in Nevada, USA. The Company has returned over $103 million to shareholders in monthly dividends since commercial production commenced July 1, 2010, and offers shareholders the option to convert their cash dividends into physical gold and silver and take delivery. The Company continues to drill both infill and step-out holes testing the mineralized vein extensions at its producing Arista mine. The Arista is a high-grade polymetallic (gold, silver and base metal) epithermal vein deposit with multiple parallel en echelon veins. The new Viridiana and associated high-grade veins are located at the far northeastern margin of the Arista deposit, approximately 50 meters from the currently-producing high-grade Vein 3 (see map below). This new zone was discovered while drilling previously known Veins 1 and 3. 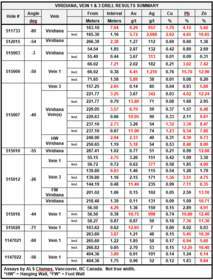 All Viridiana intercepts are polymetallic, containing gold, silver, copper, lead and zinc (see drill summary table below). Hole 511733 intercepted high-grade mineralization with 7.04 meters grading 9.29 g/t gold, 957 g/t silver, 1.70% copper, 4.15% lead and 5.60% zinc, including 1.16 meters grading 5.72 g/t gold, 2,060 g/t silver, 2.62% copper, 4.65% lead and 10.65% zinc. Viridiana remains open on strike and at depth. "It is exciting to discover additional high-grade veins while expanding mineralization on known veins, like Vein 1 and Vein 3, at the Arista deposit," said Gold Resource Corporation's Vice President of Exploration, Mr. Barry Devlin. 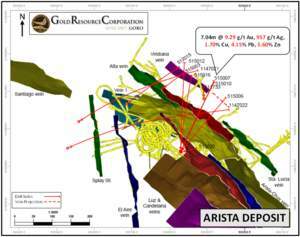 "The Viridiana vein's 7.04 meters of 9.29 grams per tonne gold, 957 grams per tonne silver, 1.70 percent copper, 4.15 percent lead and 5.60 percent zinc, in addition to other newly discovered high-grade veins near Viridiana, speak to the Arista deposit's growth and potential. We look forward to testing additional extensions at Arista, delineation and expansion to our Switchback discovery and Alta Gracia property, and other new targets along our 55 kilometer mineralized corridor." "Barry and our exploration team are doing an excellent job expanding the Arista deposit vein system," stated Gold Resource Corporation's CEO and President, Mr. Jason Reid, "We are very fortunate that after more than five years of exploring and mining at Arista, our high-grade polymetalic deposit continues to reveal additional high-grade en echelon veins. We believe this evidences a very powerful system and are optimistic it will continue to expand." Gold Resource Corporation is a mining company focused on production and pursuing development of gold and silver projects that feature low operating costs and produce high returns on capital. The Company has 100% interest in six potential high-grade gold and silver properties at its producing Oaxaca, Mexico Mining Unit and exploration properties at its Nevada, USA, Mining Unit. The Company has 54,179,369 shares outstanding, no warrants and no debt. Gold Resource Corporation offers shareholders the option to convert their cash dividends into physical gold and silver and take delivery. For more information, please visit GRC's website, located at www.Goldresourcecorp.com and read the Company's 10-K for an understanding of the risk factors involved.